A few years ago, Allen Lim, PhD, of Boulder, Co, who was working as a sport scientist and coach for a professional cycling team, noticed that the pre-packaged sports bars and drinks the athletes used were laden with artificial ingredients and literally making them sick to their stomach. He started making training food and sports drink from scratch for the cyclists; eventually developing a secret drink mix with reduced sugar, higher sodium, and no artificial sweetener, flavor or color. Lim’s mix emphasized simple clean tastes with real fruit. With better hydration and better fuel, they started feeling and performing better. But Lim discovered that the bigger issue was teaching athletes fundamental life skills so that they could take better care of themselves all the time. While working to fill that need, Lim and his business partners found that there is a demand for healthy fuel that extends beyond cyclists to racecar drivers, rock climbers, concerned parents, Peace Corps workers, and normal active individuals looking for healthy food and drink alternatives. To meet the demand to optimize performance for both sport and life was how Skratch Labs was born. Did you know that globally humans cut down around 900,000 trees daily for paper products, including 27,000 trees for toilet paper alone? The average person uses 19ft of toilet paper per day. That’s a lot of trees that will take decades to replace, or that may never be replaced. We wanted to find a sustainable alternative. Because bamboo and sugarcane are grasses, not hardwoods like trees, they are fast growing and do not require replanting. That makes bamboo and sugarcane a sustainable alternative to conventional paper made from trees, as part of an effort to minimize our overall environmental footprint. We aim to use the most innovative technology and materials in order to provide sustainable, treeless paper that is also luxuriously soft and very strong. Welcome to a cleaner world. Repurpose is a line of sustainable tableware that looks out for the health of you, your family, and the planet. We make products exclusively from plants and we are on a mission to reduce the amount of plastics in our environment and offer high quality, durable, and guilt-free renewable alternatives. Only wholesome, natural ingredients are selected for Klee Girls natural mineral makeup, Klee Kids play makeup kits and Pretendi Naturali face paint. Our Pinki Naturali water-based nail polish is so clean it is odor-free. We NEVER use parabens, artificial colors or any other harmful ingredients. We are a member of and follow the standards of the Safe Cosmetics Business Network. After all, why should we risk putting on cheap chemicals on our kids’ skin when it’s at its most delicate? All Artisan Kettle products use Fair Trade Certified™ cacao from small family farms in South America. The products are made in a state-of-the-art facility in Watertown, WI. All Artisan Kettle baking chips are nut, soy and gluten free. The Bittersweet and Semisweet varieties are also free of dairy. Artisan Kettle products are certified Organic, and certified kosher by the Orthodox Union; Bittersweet and Semisweet Chocolate are certified kosher pareve. Milk Chocolate and White Chocolate are certified kosher dairy. Artisan Kettle now has six different organic chocolate chip varieties. Caboo offers commercial and household paper products made from renewable, fast-growing bamboo and sugarcane to our customers around the world. Bamboo and sugarcane are sustainable alternatives to using trees to make paper.Because bamboo and sugarcane are grasses, not hardwoods like trees, they are fast growing and do not require replanting. That makes bamboo and sugarcane a sustainable alternative to conventional paper made from trees, as part of an effort to minimize our overall environmental footprint. Mavuno Harvest products are delicious and healthy organic mango, pineapple, banana, papaya and jackfruit. which are sourced from family famers in sub Saharan Africa. The company's mission is to source, produce and sell healthy, all-natural, delicious foods which contribute to the village level economic development and increased standard of living for rural African farmers. Mavuno Harvest uses fair trade practices with its organic, non-GMO line of dried fruits. 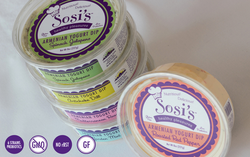 Nutritious and delicious meet rich Armenian yogurt dips; healthy and delicious collide all to satisfy your craving for something unique and flavorful. What?! You've never heard of Armenian yogurt? Welcome to the newest craze, if you love Greek yogurt just wait till you dip your chip into our distinctly scrumptious Armenian Yogurt dip.